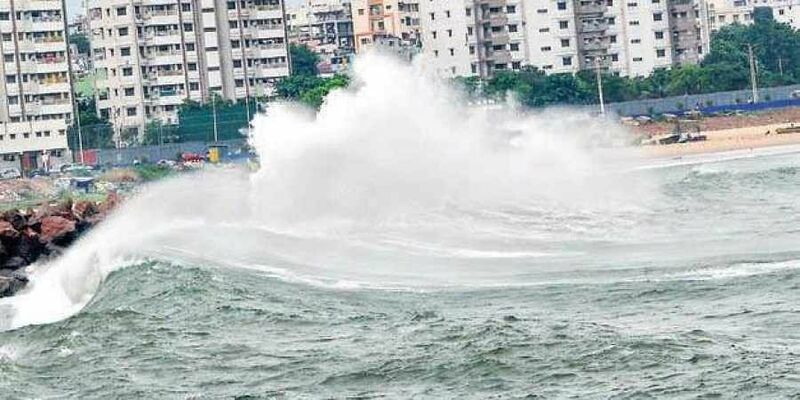 On Wednesday, heavy gales of 70-80 kmph gusting to 90 kmph lashed the three north coastal districts of Srikakulam, Vizianagaram and Visakhapatnam under the influence of Titli. VIJAYAWADA: The cyclonic storm Titli intensified into a very severe cyclonic storm, was very likely to intensify further during the next 12 hours (by Thursday morning) and its movement is being monitored by the coastal doppler weather radars in Visakhapatnam, Gopalpur and Paradip. The storm lay centred over West Central Bay of Bengal, 190 km southeast of Kalingapatnam in Andhra Pradesh. Surprisingly, the cyclonic storm dates are coinciding with that of Hudhud cyclone which devastated Vizag on October 12, 2014. According to weathermen, the cyclonic storm is likely to make a landfall between Gopalpur in Odisha and Kalingapatnam in AP around 5:30 am on Thursday at a wind speed gusting up to 165 kmph. The last update of IMD on Wednesday night recorded the gales with speed of 140-150 kmph gusting up to 165 kmph at the deep sea of west central and adjoining north Bay of Bengal. The official machinery as well as people are worried over the likely havoc to be caused by Titli cyclone. All preventive steps have been taken to mitigate the loss of life and property. According to India Meteorological Department scientist K Naga Ratna, the cyclonic effect of Titli may be more on Vizianagaram and Srikakulam, while Visakhapatnam, being the border district, is likely to be safe. Heavy rain warning for the next two days has been issued at a few places. Many areas also experienced power disruptions. Light to moderate rains have been occurring in several parts of Srikakulam since early hours of Wednesday under the impact of Titli. Strong winds have been lashing the coastline of Srikakulam. District Collector K Dhananjaya Reddy directed the revenue officials to open control rooms in all mandals. Similarly, a control room was set up at the Collectorate in Srikakulam with phone number 08942-240557. An NDRF team has already been deployed in the district and more teams are likely to be pressed into service basing on the intensity of the storm. Irrigation officials have been asked to closely monitor the water levels in the reservoirs, rivers and canals and keep informing the control room about the situation, so that villagers of flood-prone areas can be evacuated to safer places. Fishermen have been asked not to venture into the sea till Friday. Hut dwellers in coastal areas have been advised to shift to safer places. Five teams of the National Disaster Response Force (NDRF) have also been positioned at different places in Visakhapatnam, Vizianagaram and Srikakulam to take up rescue operations within no time in case of any eventuality. The armed forces have been put on alert. This is the second cyclonic storm formed over the Bay of Bengal and hitting the east coast this year. The first one, Daye, hit Odisha and northern AP last month. APEPDCL has cautioned the people to be more alert in view of the cyclonic storm Titli. APEPDCL CMD HY Dora instructed all SEs, DEs and AEs of all three operation circles in Srikakulam, Vizianagaram and Visakhapatnam to take all precautionary measures to avert any untoward incidents keeping in view the heavy rain and gales. For restoration of power in case of any disruption, APEPDCL has been fully geared up with necessary manpower and equipment. The staff have been asked to keep updating information relating to the cyclone to the APEPDCL corporate office. Special call centres have been set up in all APEPDCL circles of Srikakulam, Vizianagaram and Visakhapatnam for emergencies. The centres will work round-the-clock. Is the cyclone gonna hit vishakapatnam? ?